"These stuffed mushrooms are too big to serve as hors d'oeuvres.....just one of these enormous mushrooms can be dinner for a hungry person." Preheat the oven to 400 degrees F (200 degrees C). Remove the mushroom stems from the caps, and set the stems aside. Place the caps gill-side up on a baking sheet. Drizzle them with 1 tablespoon of the olive oil, and season with salt and pepper. Roast in the preheated oven for 25 minutes. Meanwhile, prepare the pilaf stuffing. Chop mushroom stems. Heat the remaining olive oil in a skillet over medium heat. Cook chopped mushroom stems and garlic in oil until soft. Stir in the cilantro, carrot, celery and kasha; cook 2 minutes more. Pour in water. Bring the mixture to a boil, reduce heat to low, and place a lid on the pan. Simmer 20 minutes, or until the kasha is tender. Remove from the heat, and stir in parsley. Season to taste with salt and pepper. Stuff the warm mushroom caps with the pilaf, and serve. I omitted the cilantro and celery, because I hate them. Apparently I also hate kasha. I recommend this recipe only to those who ablsolutley LOVE kasha. This is really good, although I did not use kasha but used instant brown rice instead. 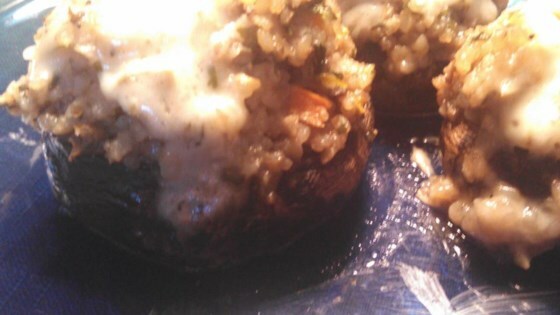 The stuffed mushroom was great. I think the 1 cup of cilantro listed in the ingredients should be 1 cup of onion. Only for true health food nuts that like that buckwheat stuff. We did not care for this recipe. And was expensive to boot using portabello mushrooms!